Have you ever forgotten a friend’s birthday? It happens to the best of us. 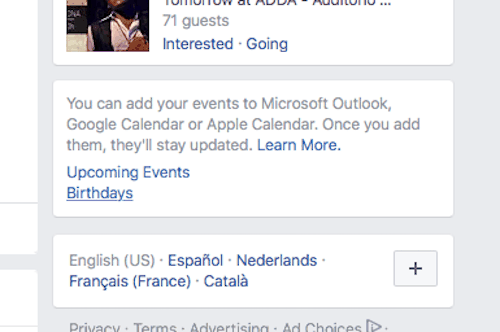 After the frustration of checking Facebook every day for birthdays, I wanted a better push notification system with better filters. 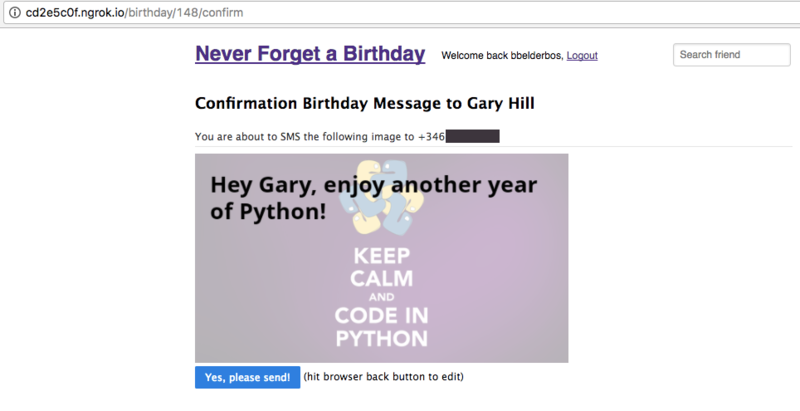 I wrote an article, Building a Simple Birthday App with Flask-SQLAlchemy, showing a way to export your Facebook birthday calendar to an .ics file and import it into a DB with Flask and Flask-SQLAlchemy. 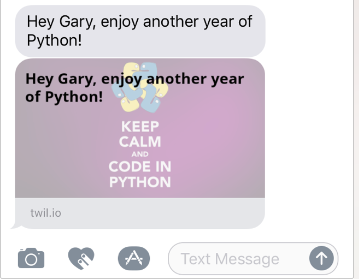 After talking to Twilio at PyCon we thought it would be cool to extend this app by adding SMS notifications and a possibility to send birthday messages via SMS, so I signed up for a Twilio account and got coding. The complete code for this project on Github. Create a Twilio account, get a phone number and API key (sid) and token. NOTE: make sure you use E.164 number formatting for phone numbers (e.g. +34666555444, +442071838750). See Twilio’s support article: Formatting International Phone Numbers. The app uses configparser to load these settings in. 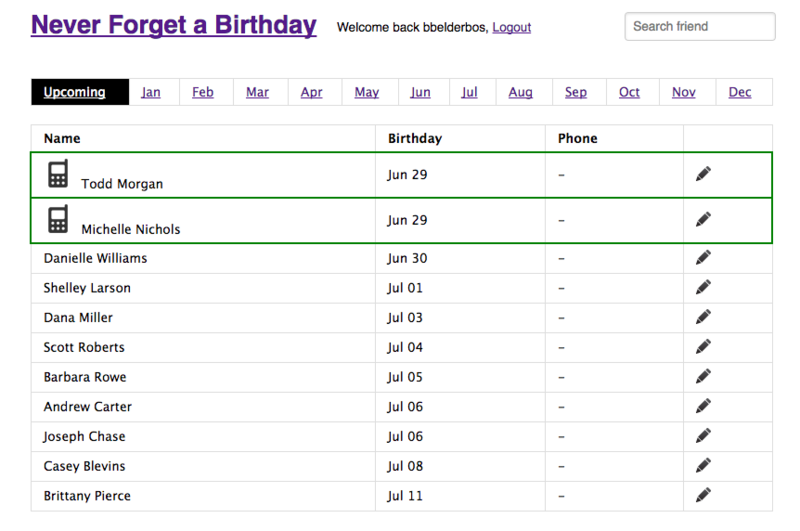 Export your birthday calendar from Facebook and save it as cal.ics in the app’s top level directory. Make sure you have your virtualenv enabled. This app has two parts: a Flask front-end and a daily cron script on the backend. 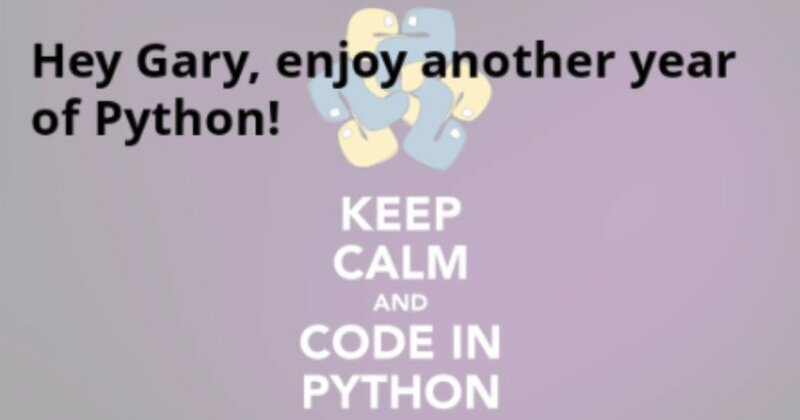 The front-end is a Flask app which you can invoke with: python app.py. At this point go to 127.0.0.1:5000 and you can see your friend’s birthdays. As we’ll see in a bit you need to add a phone number for each friend you want to receive a notification for. All Flask app code is in app.py. As you probably want to host this in the cloud, authentication is there from the start. NOTE: that to be able to send messages to your friends using the free Twilio version you need to verify their phone numbers first. You can lift this limitation by upgrading your account. You can find more info here. Various validation rules are set up in the corresponding /friends/ route. We cannot have the same phone number twice for example. With the phone number added you will get an SMS when it’s their birthday. The cron job is coded in notify.pyusing the schedule package to notify about birthdays occurring that day. The link is the entry point into the Flask app to send a birthday message or SMS card which we will see in the next section. This is the second part of the app. There are two ways to get to the send message feature: follow the link in the SMS, or click the phone icon at the left of your friend’s name from the homepage. If you include an image link, the Pillow library is used to put the text on top of the image making a simple birthday card. The code for this is in the text_on_image.py module. This is on an iPhone. On Android it did not display the image inline. For this reason it sends the text alongside the image. Having a birthday app managed by SMS is cool. Twilio’s API makes it very easy. The Pillow image integration was the hardest part of building this app. Splitting the code into various modules helped and will help manage complexity. Moving forward it would be good to add a regression test suite and possibly automate end-to-end testing with a tool like Selenium. And finally, nothing beats building practical apps when it comes to honing your programming skills. Apart from the Twilio API, building this app I learned more Flask and integration of various interesting modules. Join our Twilio PyBites code challenge to build your own automated texting app and other awesome applications each week.